We want to be the generation of peace! This summer, EYCE gathered young people from all over Europe for the seminar “Be the Generation of Peace! A seminar for young Europeans to enhance the participation and contribution of young people to peace processes”. This seminar took place in Novi Sad, Serbia, from the 18th to the 25th of August. During this seminar, thirty young people, actively engaged in their communities and coming from EYCE’s network, shared and reflected on peace & conflict issues. They were coming from 12 different countries. Half of participants was coming from EU countries, the other half was coming from Georgia, Iceland, Lebanon, Russia, Ukraine and of course Serbia. Therefore, the group of participants represented a high diversity of cultural, social and denominational backgrounds. The main aim of this seminar was to emphasize the role and possibilities of young people in peace processes in today’s Europe through reflecting and fostering the engagement of young people in peace building and conflict resolution in local and global contexts. By using non-formal education methods (simulation games, group discussions, creative presentations, artistic activities, practical workshops…), the seminar offered insights on concepts of peacekeeping, peacemaking and peacebuilding, as well as conflict resolution and on European security and foreign affairs policies. It also offered to analyse concepts and cultural perspectives on peace and conflict, to study religious and philosophical texts on peace, to give concrete practical examples on peace, security and conflict resolution and on how churches and Christian communities can get engaged in peace building and conflict resolution. An International Planning Committee (IPC), gathering volunteers from EYCE‘s network, prepared, implemented and developed the programme and methodology of the seminar, to accompany participants in their reflection and to maintain the friendly, tolerant and open-minded mood of the event. The seminar also welcomed two guests speakers: Damian Jackson (Irish School of Ecumenics), and Tamara Grdzelidze (World Council of Churches), both professionals involved in peace & conflict issues. Intercultural learning was an integral part of the seminar. In many sessions participants were encouraged to share their experiences, knowledge, and examples from their countries and local contexts. An International Banquet and the Serbian cultural evening were organised at the beginning of the week to give participants the opportunity to experience various cultures and traditions. Those activities were a great success, and allowed the young participants to get to know each other better. A quite emotional moment was the visit to the Methodist and Orthodox churches in Novi Sad and to EHO, an ecumenical humanitarian organization working with elderly, Roma communities, disabled persons, and people struggling with HIV/AIDS and cancer and raising ecumenical issues in Serbia. This intense week of the seminar ended with a practical workshop on the use of theatre as a tool for peace building, animated by Ms. Hanne Vervaele, from Pax Christi. She introduced the Theatre of the Oppressed. This form of theatre aims at fighting injustice, unfairness and oppression, by staging real-life problems in direct interaction with the audience. 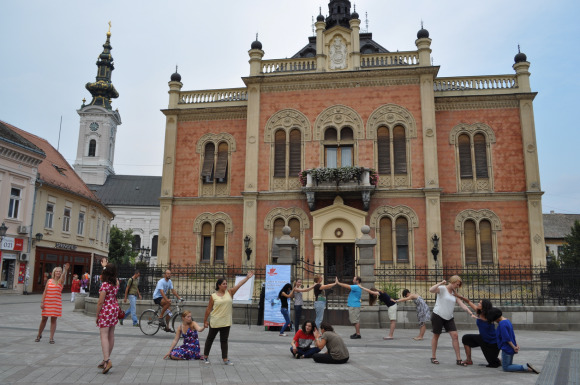 After this workshop a presentation made by participants took place in the city centre of Novi Sad, following the concept of the Theatre of the Oppressed. It was aiming to build a silent dialogue on peacebuilding with the population of Novi Sad by creating an exhibition of “human sculptures”. Participants in small groups had to interpret a “sculpture” responding to the answer: “How can we build peace?” Some participants were playing the role of guides to encourage inhabitants to enter into the exhibition and to ask for their opinion/reflection on it. On the last day of the seminar, participants developed a statement together on the involvement of young people in todays peace processes. It is reflecting the experiences, views and knowledge of the participants, thus giving an insight into the work and interests of young Europeans regarding peace processes. The statement will be disseminated within EYCE’s network and with partners active in this field. EYCE wants to warmly thank the guest speakers, IPC members and our local hosts from the Methodist Church in Serbia, for making this seminar “Be the Generation of Peace!” a great experience and success!